NEW ORLEANS – Individual national champions from the 2017 NCAA Division I track & field campaign dot the Men’s Preseason Watch List for The Bowerman. Five men who won at least one individual title at either the NCAA Division I Indoor or Outdoor Track & Field Championships last year reside on the first Watch List for 2018 that was released Tuesday by the U.S. Track & Field and Cross Country Coaches Association (USTFCCCA). 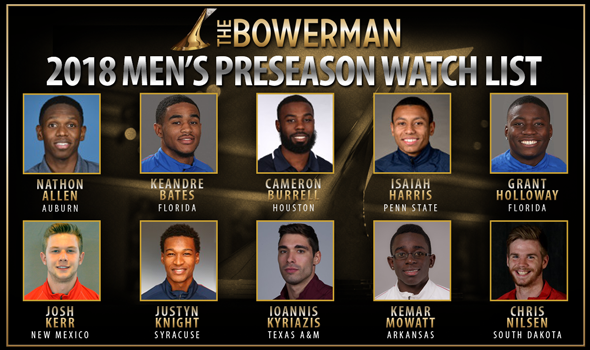 And since The Bowerman Watch List was introduced in 2010, six of the past eight winners appeared on the preseason edition including each of the past five (Christian Coleman, Jarrion Lawson, Marquis Dendy, Deon Lendore and Derek Drouin). So these 10 men already have a leg up on the competition. Also Receiving Votes: Trey Culver (Texas Tech), Grant Fisher (Stanford), Mostafa Hassan (Colorado State), Michael Norman (Southern California), Rudy Winkler (Rutgers). KeAndre Bates is the headliner of the group having three individual titles to his resume from the last calendar year. Bates became the seventh man in NCAA DI history to sweep the horizontal jump crowns in Eugene, Oregon and nabbed the indoor long jump title in College Station, Texas three months earlier. Grant Holloway put together an incredible freshman year and will likely only get better. Holloway won national titles in the 60 hurdles and 100 hurdles, finished runner-up in the outdoor long jump and turned in several scintillating legs during 4×400 relay efforts. Josh Kerr is the only other man on the Watch List for collegiate track & field’s highest honor to have won multiple NCAA titles in 2017. Kerr kicked past all comers in the indoor mile and the outdoor 1500 to become the first man since Leo Manzano in 2008 to win both of those finals in the same year. Earlier in the outdoor season, Kerr clocked the sixth fastest time in collegiate history in the 1500 (3:35.99). John Kyriazis and Chris Nilsen were each one-time individual champions in 2017. Kyriazis thumped the field in the javelin at the outdoor meet, while Nilsen soared high above the rest of the pack during the indoor pole vault. Four men who finished runner-up at one or both of the NCAA meets also found their way on the Watch List: Nathon Allen, Cameron Burrell, Isaiah Harris and Justyn Knight. Allen was second to 2017 The Bowerman finalist Fred Kerley in the outdoor 400. The now sophomore is the second male athlete from Auburn to be included on the Watch List as he joined Harry Adams (2012) in that regard. Burrell, who only has outdoor eligibility in 2018, came in right behind 2017 The Bowerman winner Christian Coleman in both the indoor 60 and outdoor 100, but helped the Houston Cougars’ winning effort in the 4×100. This is the first time an athlete from Houston has been named to the Watch List. Harris finished runner-up to Emmanuel Korir in the 800, while Knight crossed the finish line behind Edward Cheserek in the indoor 3000. Knight is the second male athlete from Syracuse to be named to the Watch List (Jarret Eaton in 2012) and recorded the fourth fastest time in collegiate outdoor history in the 5000 (13:17.51). Kemar Mowatt took third in the 400-hurdles final last year and broke out in a big way with a fourth-place effort in the final of that same event at the 2017 IAAF World Championships. Those men who didn’t receive enough votes to be on the Watch List this go-round were Trey Culver, Grant Fisher, Mostafa Hassan, Michael Norman and Rudy Winkler. The next Watch List will come out February 8 following a month of competition. KeAndre Bates and Grant Holloway have now given Florida 88 total Watch List appearances coming from 13 athletes, which is the most out of any men’s program … The SEC has brought home The Bowerman in each of the past four years and now has a total of 231 appearances on the Watch List … Chris Nilsen is the most decorated male athlete on the Watch List out of the current crop, having appeared on seven iterations … This is the first time since the 2014 Men’s Preseason Watch List that an Oregon athlete hasn’t been included. Back then, Edward Cheserek was in the "Also Receiving Votes" category.